Do you ever find yourself wondering if your daily work is becoming a bit repetitive; somewhat samey? The British HCI group conference, HCI2006 www.hci2006.org, broke through that ‘same old, same old’ barrier triumphantly for me. I expected an interesting and challenging selection of long and short papers – and I got it. I’d like to give a special mention to session six: ‘Enthralling Experiences’, on the Thursday. As chair of the session, I was grateful to all my speakers for showing up and speaking to time. As an attendee at the session, I was fascinated by so many different insights on the question of how to understand and measure non-task aspects of interfaces: aesthetics, immersion, familiarity and desirability. But I hoped for even more. This conference was home to two new events. ‘(re)Actor: The First International Conference on Digital Live Art’ and the ‘First Symposium on Culture, Creativity and Interaction Design’. I couldn’t attend because I was teaching tutorials at the time, so I had to get my fix of an artistic take on HCI by attending the session on ‘Designing the ‘Not Quite Yet’: Ideas and Methods for Engaging the Public in a Digital Future of their Choice’. This workshop, chaired by Ann Light and Patrick Healey, practiced what it preached as attendees took time from their deliberations to present a session on their work to the conference as a whole. We kicked off with a series of presentations from artists about the forthcoming exhibition on radio-frequency identification (for Londoners, it’s the technology that drives the Oyster card. You’ll have to imagine the aesthetic effects such as the artistic rant about the politics of rfid, and the fun of real snail mail: an exploration of email that uses snails with rfid capability. 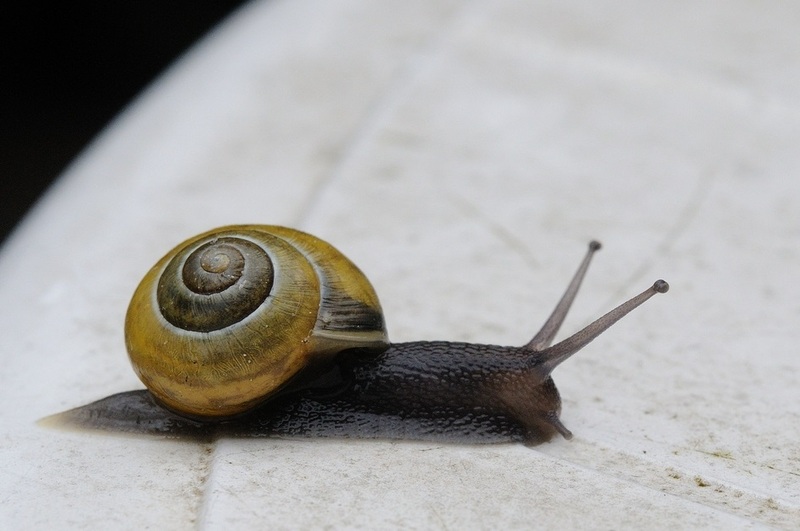 Yup, that’s real snails crawling. I had to tear myself away from the session early for a commitment elsewhere, but just had time to catch two low-tech ideas for exploring new technologies. Simon Bowen researches how users can be involved in the generation of ideas (ideation) in innovative product development. Sometimes he uses highly-developed artefacts such as his digital photo frame that features a lever: the picture fades gradually, and you have to interact with it by using the lever to bring the picture back. Or use the lever to delete the picture altogether. Fed up with the delinquent son? Erase him from the photo frame and everywhere else he appears. Simon also showed us a device about as low-tech as they come: a prototype ‘remote control for a house’ made from an empty margarine container and a few labels. If you pointed this at something in your house, what would you want the house to do? He’s found that the obvious inadequacies of the prototype help people to imagine. But will they imagine better with a higher-tech object? Don’t know. So he’s going to try again, this time with a variety of prototypes that include something rather like a space gun. I’m looking forward to finding out how he gets on. Dave Ellender then gave us an insight into a technique that made margarine cartons look positively fancy. He described the liberating effects of using masks, then handed each of us a paper plate. We had to think about a scenario, draw a mask on the back of our plate and then talk to our neighbour ‘in character’. Estimated cost: 10 pence per participant. Actual effect: we were all engaged, interested, and exchanging insights within seconds. I love it. I’ve been keen on paper for prototyping for ages (Carolyn Snyder’s book is the definitive reference). But now I have paper plates and margarine cartons in my potential toolbox. What low-tech ideas do you have?